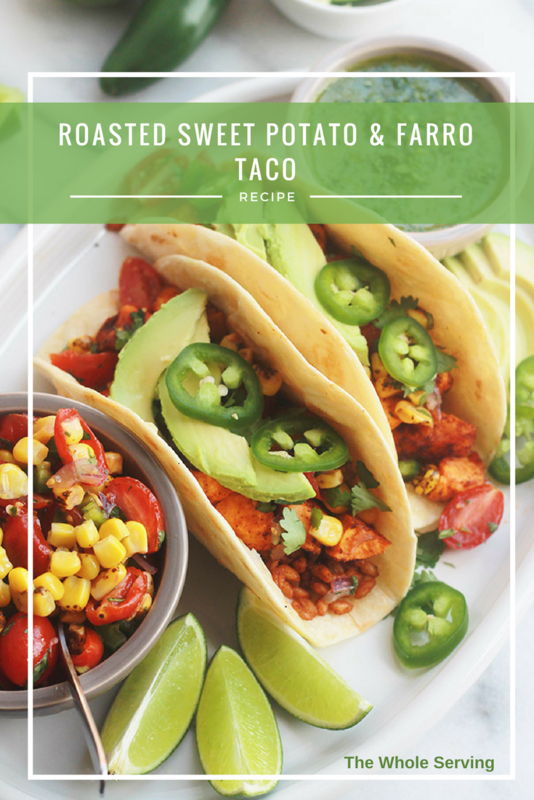 Roasted Sweet Potato and Farro Tacos – Roasted sweet potatoes paired with farro, served with your favorite toppings and sauce, wrapped up in a corn tortilla. 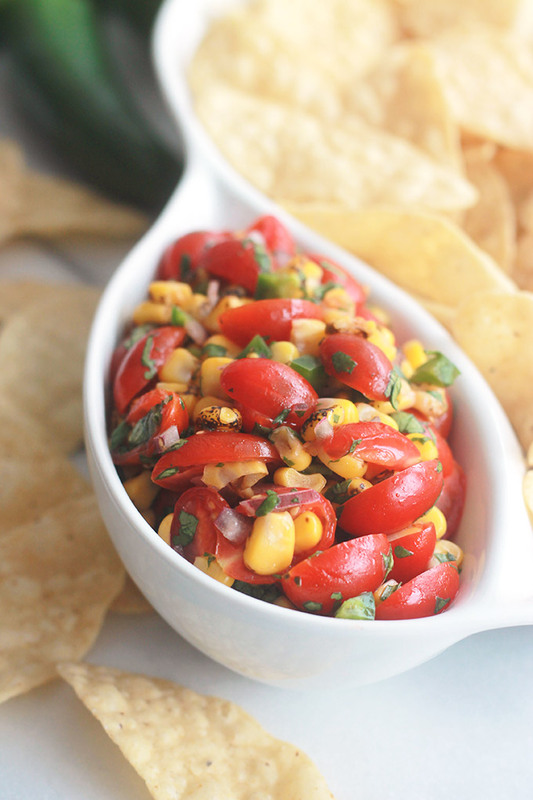 Perfect for Taco Tuesday, Cinco de Mayo, or any gathering of family and friends. 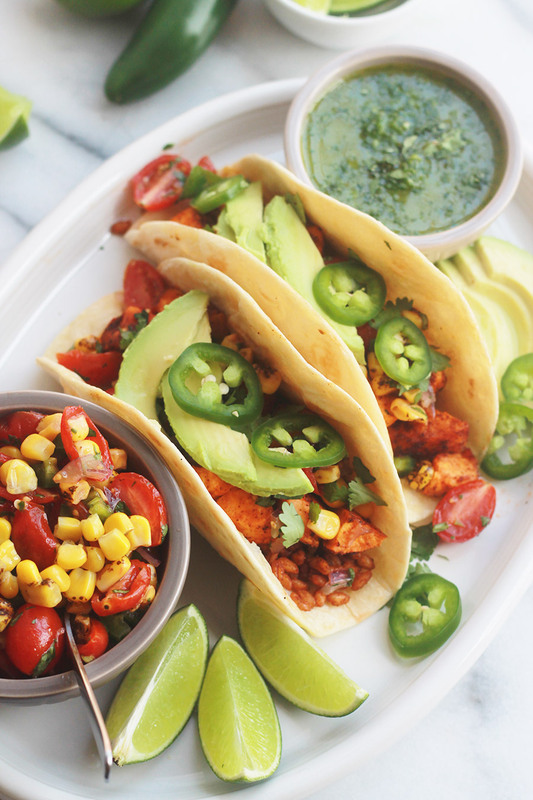 Tacos, one of the easiest meals to put together. Taco meals don’t have to be elaborate or take loads of time, these Farro Stuffed Tacos can no on your table in 30 minutes or less. What’s so wonderful about Tacos?, They can be customized to what you have on hand. 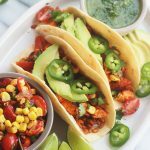 If you are looking to have a Meatless Taco Tuesday there are a wide variety of main ingredients you can use as your filling to create amazing flavor and texture. Ingredients like lentils, tofu, beans, nuts, fruits, veggies and any grain. 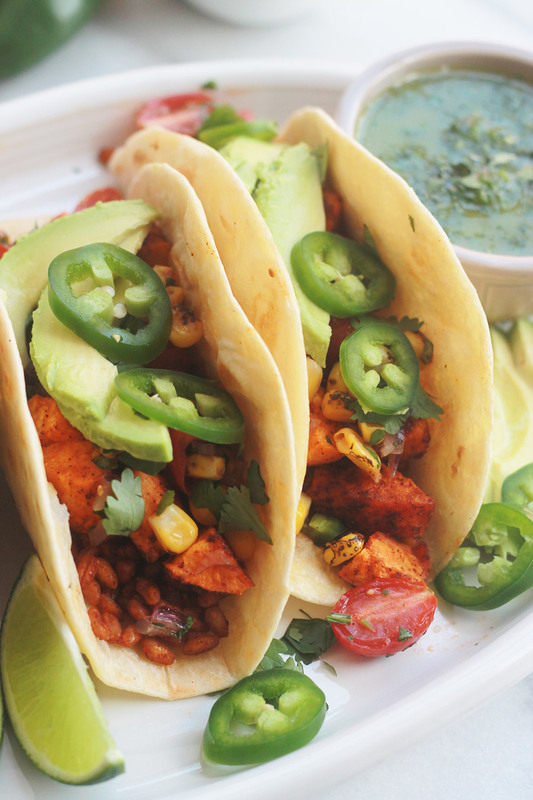 These tacos feature two of my favorites, farro and sweet potatoes. Multi-tasking in the kitchen can put this meal on the table in under 30 minutes. While roasting the sweet potatoes in the oven, prepare the farro on the stovetop. Now let’s talk sauce and toppings, for me tacos aren’t complete without a sauce and great toppings. Sky’s the limit when it co taco toppings. Use your favorites or be adventurous and try something new. In these Roasted Sweet Potato and Farro Tacos, I used sliced jalapeños, avocados, some amazing Spicy Cilantro Sauce and Fire-Roasted Corn Pico Style Salsa. 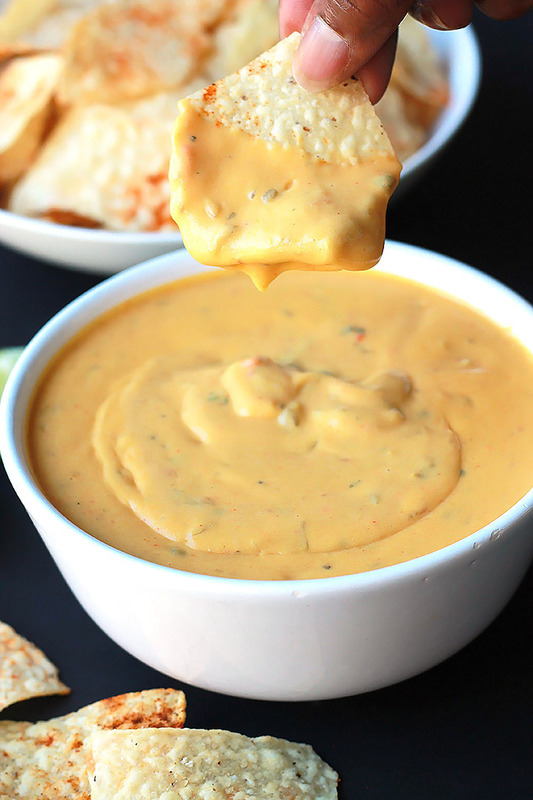 Both super easy to make. Throw a Taco Tuesday or any other day if the week Taco Party and have your friends bring their favorite fillings and topping. Be creative and have some fun. 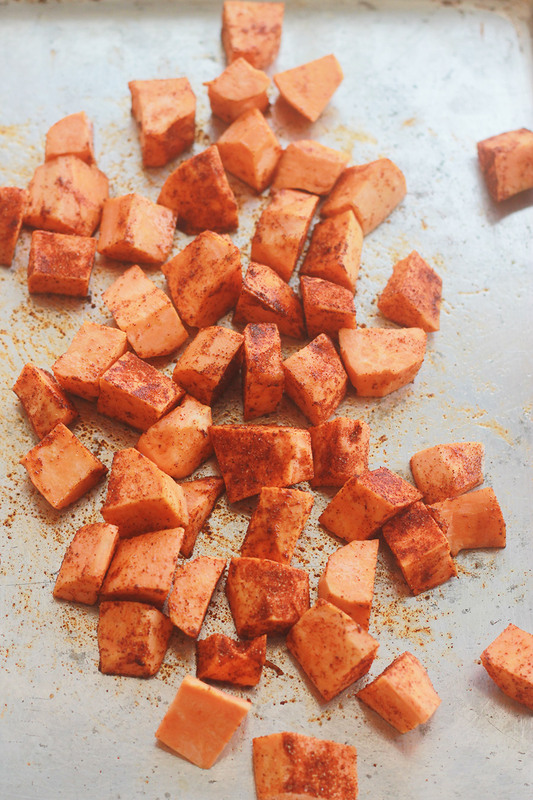 Place sweet potatoes on a shallow baking pan, drizzle with 2 to 3 teaspoons olive oil, sprinkle cubes with ½ tablespoon of the taco seasoning, toss to coat. Arrange the cubes in a single layer on the baking sheet. Bake for 20-25 minutes until fork tender. Remove from oven and set aside. 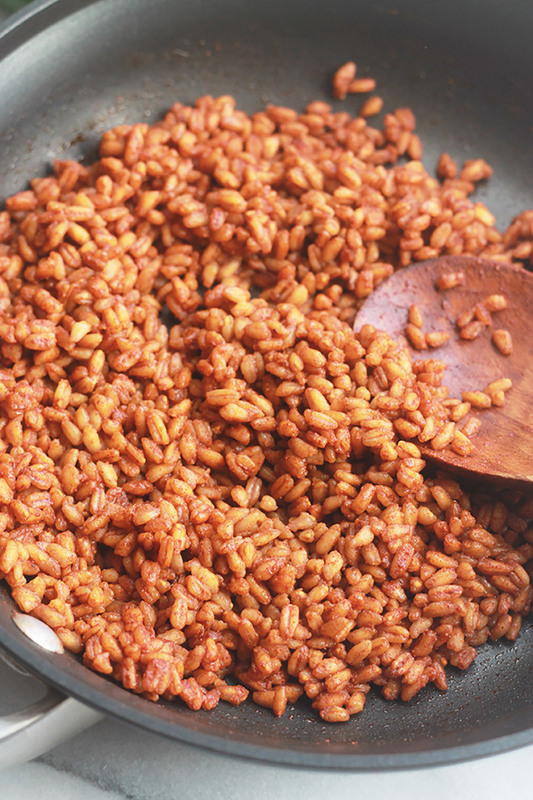 While sweet potatoes are in the oven, sauté farro in a skillet over medium heat with the remainder of taco seasoning and 1 tablespoon of water, add more as needed to prevent from sticking. Sauté until well coated with seasoning and heated throughout. (about 2 to 3 minutes). Heat each corn tortilla in a small skillet over medium heat for 20-30 seconds on each side. Fill tortillas with farro and 3 to 4 cubes of sweet potatoes. Top with desired toppings, salsa and sauce. 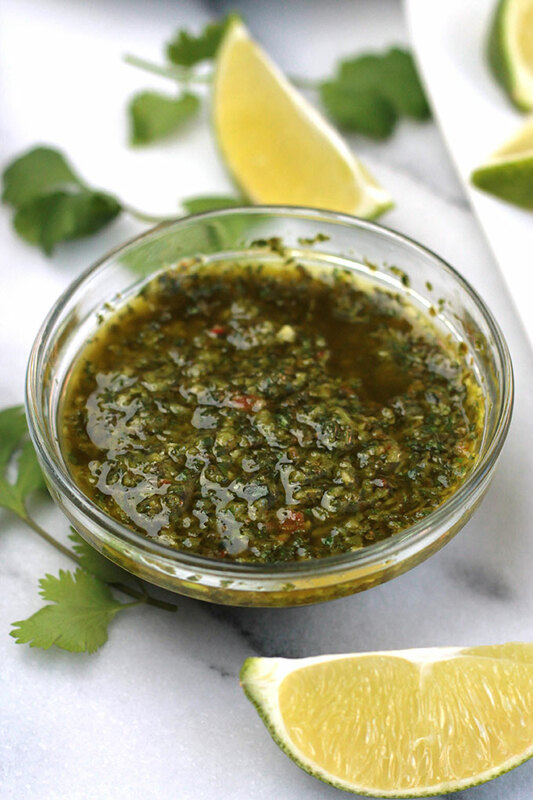 Garnish with cilantro leaves and serve tacos with a wedge of lime. If you make this recipe or a version of it, take a picture and share with me on Instagram, tag it #thewholeserving or leave a comment below. I’d love to see or hear about your version of these Roasted Sweet Potatoes & Farro Tacos. What’s your favorite Taco filling and topping? 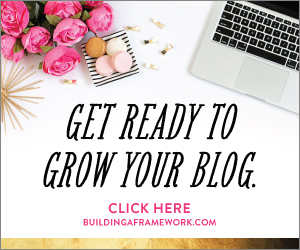 Let me know leave a comment below.